Lake Washington is the largest of the three major lakes in King County, and the second largest natural lake in the state of Washington. 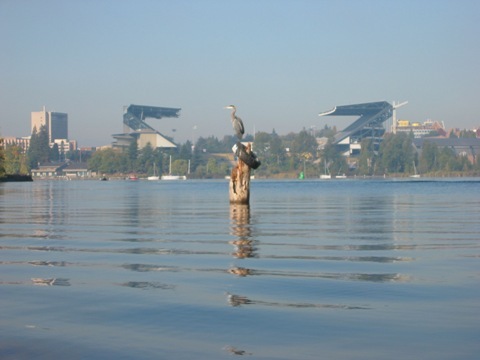 Learn more about the history of the lake and water quality monitoring efforts by reading the Lake Washington Story. King County currently has four sampling stations located in Lake Washington; Station 0804 in the north near the mouth of the Sammamish River, Station 0852 in the deep basin near I-520, Station 0826 mid-lake off Sand Point, and Station 0831 in the south end near the mouth of the Cedar River. Station 0852 is the legacy station that the University of Washington began monitoring in 1993. The other stations have been monitored since the early 1980s. In addition, sampling stations located around the shoreline of the lake, mostly near influent streams, were sampled from the mid-1980s until the program reduction in 2009. Samples are collected twice monthly from March through November, and once monthly from December through February. There is also a monitoring buoy located in the central basin of the lake that collects continuous temperature, pH, oxygen, conductivity, chlorophyll-a, and turbidity readings throughout the water column, as well as weather information. Use the charting tool to look at graphs showing single parameters. Choose a sampling location on the map to view or download data.